It is snowing again here. I am really ready for Spring to come. I woke up this morning with an unwelcome problem. I can't stand up without getting very dizzy - so I have been resting in hopes that this will stop the problem. I haven't been out of my room all day so I had my husband bring my laptop so I could post a little something (fortunately it is Saturday and he has been here to take care of me). I made this card a long time ago but I don't think I ever posted it. With luck, tomorrow will be a better day and I will share the details. I wonder if you can guess which cartridge I used? I hope you all are having a nice weekend and not too much snow! I hope you get to feeling better soon. I had vertigo once, with similar symptoms, and it was probably the most fearful thing I've experienced. Please take care. Diane, I am sorry that you are unwell today. Hopefully tomorrow you will feel better. And yes, I too am ready for spring. In fact, it usually IS spring already here in SC. Oh climate change how unhappy I am with you! Beautiful butterfly! Sorry to hear that you were getting dizzy. That's a lousy feeling! Hope you are well soon! Wow I checked in really early and got lucky to see your post. I think that is the butterfly from Home accents, but it looks slightly different. Hope you feel better. I sometimes feel like that when I am about to get a migraine. I sure hope you are better soon. oh Diane this is so very pretty! Sorry about your dizziness...my sister gets episodes like this when she has a sinus infection. Sounds like your hubby is taking good care of you. Feel better! Very pretty card - hope I have the cart you used. Feel better soon. Oh Diane, I'm so sorry you are suffering from this..have you had a cold lately. I tend to get this once a year for some reason. Please rest up, and if it doesn't get better, get to your MD, OK! (bossy Nurse advice :) ). Your card is gorgeous btw, and definitely one I need to case! so pretty, and the butterfly is very elegant. Again, feel better soon, rest up, tea, and maybe have your legs propped up a bit. Wow! This is beautiful! Hope you are feeling better real soon! Hope you are feeling better and over the dizziness. Love the card, but haven't checked out cartridges, so not sure which one you are using. Sorry to hear you are under the weather. 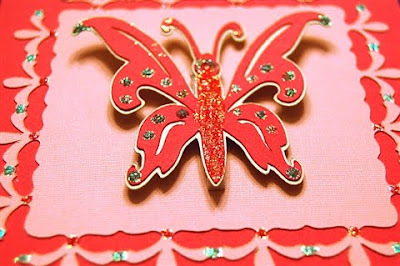 I haven't seen this card and love butterflies. I like the border on the pink what cartridge did you use to make it? Oh no Diane - I hope you just needed some rest and drink lots of liquids. Hope you are feeling better. Diane, I hope you are feeling much better soon. Without looking at any carts I would "guess" Indie Art but reallt don't have a clue. Hope you're feeling better soon! I've been ready for winter to be over too, and we didn't get nearly the snow you did this weekend. Sounds like an inner ear problem. i am saying prayer for your speedy recovery. hope you feel better soon. thanks for sharing with us..
What a good husband you have! Hope you're up and running again soon! So sorry to hear you're not feeling well..hope you get better soon! I can't believe you actually posted a few things the last couple of days feeling like you did/do....you are truly dedicated to your blog, many followers and frequent visitors. I love seeing what new creations you have come up with and all of the great, helpful, inspirational tips and encouragement you so generously share and give. Thank you so much. You are one talented lady!! I'm glad your hubby was there to take care of you this weekend; it's nice to have someone close by that you can depend on. Get well, but don't rush back to things - take care of yourself. Hope you are feeling much better - I love your butterfly and all your tutorials. Just wanted to let you know I left you an award on my blog!